In December of 2017, Santore Friends will be initiating a new speaker series. Notable individuals who have enriched our community in many ways will be appearing at the Charles Santore Library to share their ideas and inspiring personal stories. The first of these speakers will be Charles Santore, Jr., the son and namesake of the famous Philadelphian for whom our library was renamed in 2004. Mr. Santore will appear at the Library, located at 7th and Carpenter Streets, on Saturday, December 16, 2017 at 3:00 PM. He will be signing copies of The Wizard of Oz, his famous rendition of The Night Before Christmas, and his new edition of Alice in Wonderland (released in October). Book sale proceeds will directly benefit the Library and its programs. Queen Village’s Head House Books will be on hand to sell copies of Charles Santore’s wonderful books, which would make much appreciated and timeless gifts for the Holidays. Head House Books is pleased to share the proceeds of the sales of Mr. Santore’s signed books with the Charles Santore Library. Charles Santore, Senior, a South Philadelphia native, was born in 1910. He was a former boxer, Republican ward leader, and the founder of Municipal Employees Union Local 696. At the time of his death, he was the oldest active ward leader in any party. The Southwark Library was renamed the Charles Santore Library on March 26, 2004 to honor this renowned citizen of our community. Charles Santore, Junior was born in Philadelphia in 1935, and is an award-winning American illustrator best known for his children’s books. 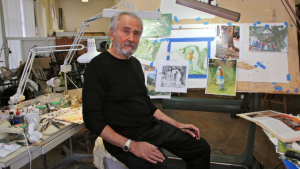 He won the Hamilton King award from the New York Society of Illustrators in 1972, and his book William the Curious was honored in the 1998 Storytelling World “Stories for Pre-Adolescent Listeners” category. His most popular works include celebrity portraits that he completed for TV Guide. Santore attended the Museum School of Art (now the University of the Arts), where he studied illustration. Upon graduating in 1956, he served in the Army before returning to Philadelphia to work in a small art studio. He began his career handling assignments from the N.W. Ayer Agency. His first editorial assignment was for the old Saturday Evening Post, then headquartered in Philadelphia. In 1985 he was approached by Running Press to illustrate a new version of Tales of Peter Rabbit by Beatrix Potter. This was a life-changing experience, realizing how different it was to illustrate an entire book rather than just one image. His work has appeared in publications such as Redbook, Ladies Home Journal, Esquire, Cosmopolitan, National Geographic, and many others. His illustrations are part of permanent collections at many locations including the Brandywine River Museum, Chadds Ford, Pennsylvania, The Free Library of Philadelphia, New York City’s Museum of Modern Art, The United States Department of the Interior, and many private collections. From February 17th to May 13th, a retrospective of Mr. Santore’s work, “Fifty Years of Art and Storytelling,” will be hosted at the Woodmere Museum in Chestnut Hill. We are honored that Mr. Santore has agreed to speak at the Library for this book signing event on December 16th. For more information about the December 16th event, please contact Mitchell Bach at 215-429-0100. Hey! Someone in my Facebook group shared this website with us so I came to check it out. I’m definitely enjoying the information. I’m bookmarking and will be tweeting this to my followers! Wonderful blog and wonderful design.